JohnnyTwoToes considers this french made scifi/action thriller a wasted potential! Luc Besson is probably France's best known film director and he has done some truly great films like Le Femme Nikita, Subway, The Messenger: The Story of Joan of Arc, The Fifth Element and perhaps his very best Léon: The Professional. These are different films but all terrific. They are deep and well written and directed with style which baffles me as to why his most recent Lucy with all the pre-release hype and excitement is such a disappointment. 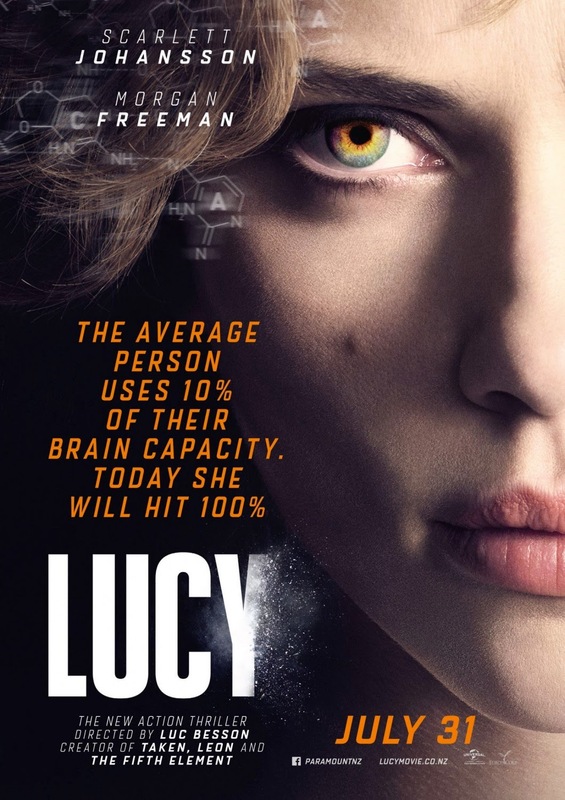 Lucy opens up to a world of complex plot possibilities but turns out to be just a dumb sci fi action film bordering on insane logic and preposterous scientific nonsense. Scarlett Johansson is Lucy, a free spirit who is traveling around the world. After she is duped by her scummy boyfriend into delivering a mystery case filled with exotic drugs to a Korean gangster played with pulp aplomb by Korean superstar Choi Min-sik (Oldboy), she ends up with the drugs sewn into her stomach. When the drugs apparently of a new different variety start to leak into her body, she starts to notice visible changes in her cognitive and mental skills and physical abilities. Beyond a remarkable physical resilience including an astounding capacity to self heal and defy gravity, she realizes she is getting smarter (literally) by the minute and can access more of her brainpower. As the drugs continue to leak into her body, her brain and body expand to superhuman levels and the more smarter/intelligent/stronger she becomes. Other scifi films inevitably come to mind? The much superior Limitless with Bradley Cooper and the wasted potential Johnny Depp's Transcendence. Lucy however like Transcendence unfortunately, could not hold Limitless's jock strap, I am afraid. Johansson is a fine actress and does a great job with her role, but she is given nothing fresh to do here. There are mindless shootouts, a car chase that completely defies logic and in spite of Choi Min-sik's spirited performace, the absence of a truly smart and diabolical villain. After a good start, everything in Lucy seems to be set on autopilot. This kind of film is agonizing to sit through and at 90 minutes (barely) it seemed long. Some of the visuals of the film are undoubtedly impressive but Lucy sputters along with Johansson carrying this film to a rather disappointing conclusion. For added measure, Morgan Freeman is cast as a doctor who seems to be here for no other reason but give the film some gravitas. But, sadly his character is also wasted and does nothing to enhance anything. The rest of the characters are so thinly created that none of them are really even needed, for the most part. Why create a character and do nothing with them? So empty they are, that there is nothing for the viewer to engage them on any level so I did not care what happened to them. While the ending is strangely logical, it still comes across very predictable and I was left feeling cheated and let down. Lucy will have that effect on you, more than likely. I did like Eric Serra's score as it bounces from action mode to jazzy and sometimes comical as Lucy can't seem to make up its mind what it wants to do. There are some humorous scenes too but since we never really get to know any of the characters, I had no vested interest what happened to them. In the end, Lucy ends up shallow, vapid and uninteresting with only Johansson, some snazzy visuals and Eric Serra's score to keep you occupied. These three saving graces try hard but Besson's direction is scattershot that Lucy never settles down into a coherent film. It plods along with out a brain in its pretty head.